The President of the Ontario Federation of Labour, announced on September 22 that he would not seek re-election after 3 terms in office. Sid Ryan, 63, is considered by many to be the most progressive leader of the Ontario House of Labour in generations. His legacy includes: active international solidarity, a willingness to speak directly to rank and file members over the heads of the affiliated unions, and mobilizing tens of thousands of workers for labour solidarity rallies across the province. He was openly critical of the rightward drift of the Ontario New Democratic Party under Andrea Horwath. 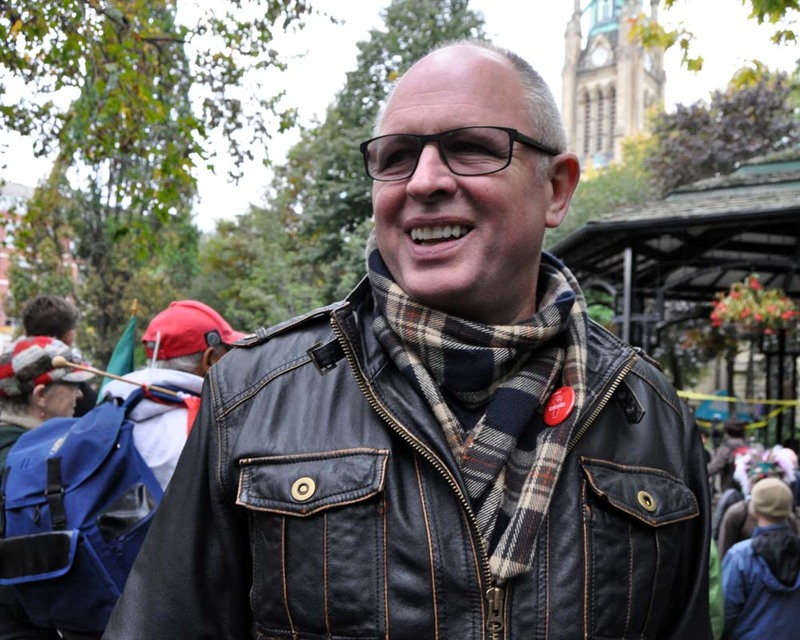 While he toned down support for the labour-based NDP in the June 2014 Ontario provincial election, he rallied the labour movement to defeat the union-hating Conservative Party leader Tim Hudak. In a CBC radio interview, Ryan stated that he believes there is general agreement on the necessary direction for the labour movement, but that certain labour partners would not work with him personally. The truth is that there is no consensus across the labour bureaucracy on policy or action. While much of the ‘turf war’ occurring amongst the bureaucracy appears superficial and personality-centred, it is clear that there are major differences over how to oppose austerity at home and how to approach international working class solidarity. Sid Ryan openly criticised the leader of the Ontario NDP, while other unions such as the Ontario Public Service Employees’ Union supported her shift to the right. Ryan is a vocal supporter of a Free Palestine, and the boycott of Zionist apartheid. He denounced police violence and racism. He is critical of capitalism, and argued for a stronger fight back against capitalist austerity by labour unions and the NDP. These are issues in which very few labour leaders participate today. And that is why a number of labour bureaucrats sought to undermine and remove Sid Ryan – since day one of his presidency at the OFL. He was the victim of a bureaucratic coup from the right. Socialists were correct to defend him, and to work with him whenever there was a convergence of views, which was often. Ryan says he will continue to be active in the House of Labour, and that’s good. What is clear from this experience is that the change needed to effectively fight austerity, two-tier pay, the wage freeze, erosion of pensions and health benefits, racism, environmental destruction, and capitalism in general, cannot occur simply by replacing ‘mis-leaders’. Workers need to take concrete steps to build a class struggle, left wing caucus in every union to challenge the labour leadership from the bottom up. 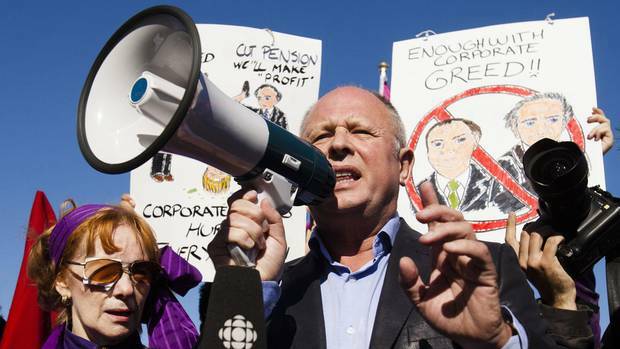 The OFL, and all unions, should focus on how to defend workers from continuing austerity. Take the example of education workers. Leaders of public secondary school teachers, Catholic, and French school board teachers reached bad deals with the Ontario government. They left the largest teachers’ union, the Elementary Teachers’ Federation of Ontario, as well as education sector workers represented by CUPE Ontario, to fight alone against the bosses’ regressive demands. Unions should coordinate and work together in order to defend one another. In unity there is strength. Unions are made up of two parts. The labour bureaucracy and the rank and file membership. These two are separated by the material benefits that accrue to the bureaucracy. Perqs and privileges tend to change the perception of full-time union leaders. They come to see things closer to the point of view of the boss class, and farther from the outlook of their working class membership. Not all leaders are the same. There can be significant differences. Still, we should not rely on the bureaucracy, but seek to continuously challenge and to replace them when necessary and possible. The Workers’ Action Movement (www.workersactionmovement.com) is one attempt to challenge the status quo. WAM is a positive force for change, inside and outside the ranks of organized labour – one that is determined to break the hold of capitalist austerity and to end the downward spiral of concessions bargaining. We are working to establish a cross-union, class struggle caucus that is anti-capitalist, anti-austerity, anti-concessions, and pro-union democracy. We believe workers should strive for change based on policies, not on personalities; to replace misleaders on political grounds; to affirm union democratic principles from the bottom up; and to build an independent, class struggle movement from below that is inclusive, transparent and accountable. We seek to change the overall direction of our unions, and to support union activists who battle concessions and anti-democratic practices in unions. We aim to work with those who engage with social justice movements, and we welcome all workers and activists from those movements. WAM will host an open forum at the OFL Convention, November 23-27, at Toronto’s Sheraton Centre.